Here we go, @harry_rag. An array of interesting match-ups this weekend starting tonight. What bets have you got lined up? Finally, Castleford rated very low odds to win. It seems their capabilities are no longer being underrated by the bookies. Shame, it was nice whilst it lasted. 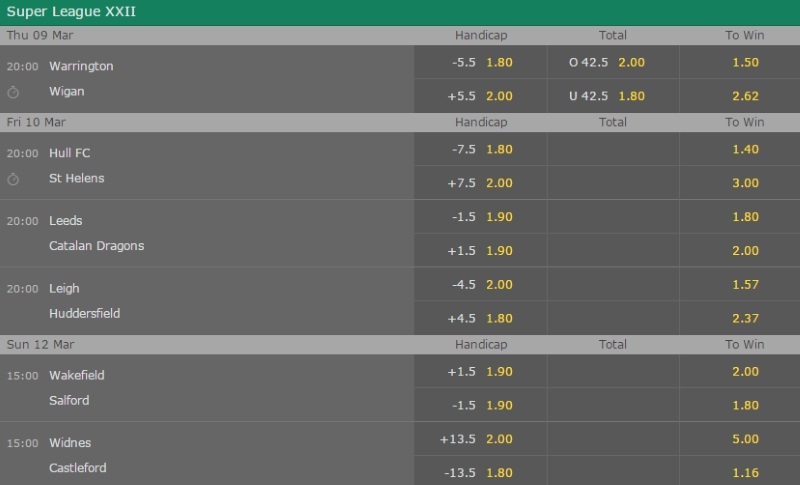 Tempted to throw some money on Wakefield to beat Salford at home and Leeds to beat Catalan Dragons at that price. Difficult game to call this evening with Warrington struggling to get into full stride and Wigan beset by injuries, especially in the backs. Wigan are likely to have very inexperienced wingers who will doubtless be targetted. This could produce openings for the likes of Tom Lineham and Ryan Atkins. Because I don't trust Warrington enough to buy hotshots or try minutes on the spreads, I've backed Tom Lineham to score a try anytime at evens (Ladbrokes/Paddy P) and Ryan Atkins at 6/4 available with the same firms. Well done on Lineham and Atkins, unfortunately I've "liked" the retrospectively as I didn't have time to consider following. Thanks, Harry . Nice to grab two of Warrington's three tryscorers. Whilst Wigan's rookie wingers may have been a little naive defensively as expected, Liam Marshall's 4 try haul definitely points to him as an exciting player for the future!